Following on from their fabulous radio show yesterday, 5Live F1 are previewing the 2011 Formula One season a little bit more with a unique video. 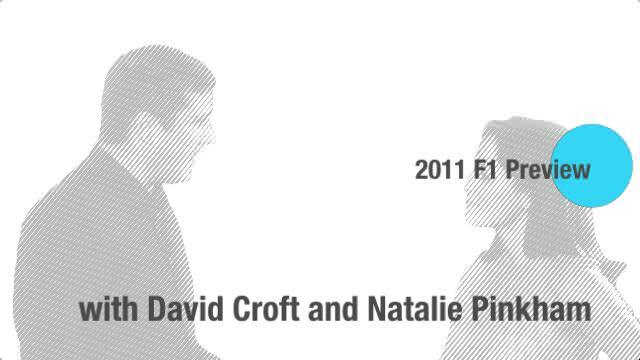 Two thirds of the 5Live commentary team, David Croft and Natalie Pinkham, tackle questions such as changes in the 2011 regulations, which of the new drivers will do well, and who might be fighting for the championship. Making her Formula One presenting debut, Ms Pinkham poses the questions whilst Crofty gives insight into moveable rear wings and KERS devices, before detailing his championship predictions. The video makes me feel like I'm eavesdropping on a conversation, but who better to listen into than our favourite 5Live team? I’m not sure the moveable rear wing is exactly what we need to promote overtaking. I remain to be convinced, I’m keeping my fingers crossed that there will be, but I just get the feeling that it’s going to have a negligible impact in the first few races. Please do watch the video in full, the F1 season is just around the corner and this is a great way to whet your appetite. We cannot wait to hear these two in action from the circuit. NP: David, talk me through the changes for 2011, and the impact of those changes. DC: There’s a few of them. First and foremost, rubber. Bridgestone gone, goodbye Bridgestone, thank you very much indeed, it was nice knowing you. Welcome Pirelli, and already some of the drivers are saying: “These tyres aren’t very good. These tyres aren’t going to last, they’re not as durable, they’re not as solid as the Bridgestone tyres.” Which is great, and that’s exactly what I want to hear. Because for fans, if you get tyres that wear quite easily, then these boys in the cockpit, they’re going to have to nurse them and they’re going to have to suffer from a lack of grip and a lack of grip should mean a little bit more overtaking. So it’s great that the drivers are saying that the tyres are rubbish. They’re not. Pirelli, for us fans, have done their job. Then we have KERS. Welcome back to KERS, which is a little power burst. You store it up in a unit that’s normally under the fuel cell, it’s energy that’s recovered under the car’s braking system. Doesn’t make it green, not at the moment, but it does mean that if you’ve got KERS running in your car, you get a little power boost for 6.6 seconds of the lap and it makes the car go a little bit faster. Now, if you’ve also got the moveable rear wing, and you’re within a second of the car in front of you, you can start using that on the straight as well. And you’re looking a little bit quizzical about this, aren’t you? NP: Well, I don’t get the 1 second thing, how on earth are you going to know? DC: Because they’ve all got a standard ECU. Every single car has an ECU that has a little display on the driver’s dashboard - we call it the dashboard, it’s part of the steering wheel - and that will tell you when you can use it. It’ll be monitored by the FIA and regulated quite tightly, but for 600 metres down the straight in the race, if you’re within one second, you can move your rear wing, open up a little gap, reduce your drag, and you go a little bit faster. DC: The best thing I think for that is that in qualifying, you can use it for pretty much the whole of the lap if you want to, on the straights of course. Don’t use it round the corner, your downforce would be so bad you’d be spinning off into the gravel. I’m not sure the moveable rear wing is exactly what we need to promote overtaking. I remain to be convinced, I’m keeping my fingers crossed that there will be, but I just get the feeling that it’s going to have a negligible impact in the first few races. The good thing is the FIA can tinker with it, and we should, by the end of the season, get a system that promotes a bit more overtaking because that’s what we want to see. NP: Absolutely. Now, talking about the tyres, is it going to mean a lot more pit stops? DC: We should get two stops a race, because if they’re only lasting 10, 15 laps, there’s no way that if it’s a 70 lap race, you can go out for 65 laps on your next compound. Two stops is good, brings strategy back to the fore a little bit more, keeps the pit crews on their toes. You will do a pit stop at some stage this year, and you’ll realise just how tough it is. NP: And who will the tyres favour? Which drivers? DC: They will favour the drivers that can actually manage the tyres, that can nurse them round, that are a little bit gentle. So if you’re turning in aggressively, if you’re wearing out the rears especially, you’re going to have to change your style a bit. We always say Jenson Button is a master at looking after his tyres. He’ll be hoping that he can do that once again, because he’s got a tough year coming up, against Lewis Hamilton once more, in a team where now he’s very much at home, he’s part of the scenery, he’s not the new boy anymore, and he’s got something to prove. NP: Let’s talk about new drivers, who should we look out for? DC: Four new drivers. Jérôme D’Ambrosio, nice to see a Belgian back in Formula One. Pastor Maldonado, nice to see a Venezuelan back in Formula One. But the two I’m keeping my eye on, first and foremost from Mexico, Sergio Pérez, driving the Sauber. The boy, I thought was very impressive in GP2. I know he finished runner up to Maldonado last year, but I thought he had some cracking races. And Paul di Resta, cousin of Dario Franchitti, a man born into a racing family, and he did a superb job for Force India last year. He was their test driver on the Friday, never got the benefit of running the option tyre, was always on the hard tyre, longer fuel runs, but did a solid job. Learnt a lot, I think he’s an excellent racer. Won DTM last year as well, racing against Sebastian Vettel in Euro Series F3 a few years ago, and beat him at the same team as well. NP: And beat him, that’s the crucial thing, a Brit beat him. That’s exciting for us. DC: Well, it is exciting. It’s good to have another Brit on the grid, especially for our coverage as well, and a Scotsman back on the grid as well. NP: So, who’s going to do it for 2011? We’ve got five champions on the grid, who is going to triumph this year? DC: It’s the $64 million question at this time of year. I remain to be convinced at the moment that anyone bar Red Bull will go into that season feeling totally confident. In 2009, before we had the double diffuser, Red Bull had a great car, generated a lot of downforce and it was the best of the rest. Brawn swept the board because they had that double diffuser. Well that’s gone now, and there’s no reason to think that Red Bull won’t go back, as an evolution of this car, of the 2009 version, go back to where they were at the start of 2009. Adrian Newey will come up with some brilliant design and I think we should be okay. In Sebastian Vettel, they’ve got a very confident driver, he’s world champion, and he knows that he has the beating of Mark Webber, especially in qualifying which I think is where it counts for those two. For Ferrari, they’re probably the best of the rest at the moment, and we talk just before the final test so we’ll see what happens in Barcelona there. But as a team for the constructor’s championship, no, because I think Felipe Massa, we’ve seen the best of Felipe Massa. I hope he comes back to how he used to be, I just can’t see it at the moment. Sadly, that accident and the recovery period from it just took a little bit out of Felipe Massa, and Fernando Alonso is top dog at that team now. So, not for the constructor’s but Alonso for the world championship, because his teammate won’t be nicking too many points off him, you might just see him up there. And then you’ve got McLaren of course. Lewis and Jenson, they’ll take points off each other throughout the season, which might be to the detriment of their own world championship challenge. They can both win a world championship, they’ve both won a world championship, but for me, my money’s on Sebastian Vettel for the moment. NP: We hear it here first, Sebastian Vettel, that’s it. 2011 champion, David says it. DC: But then again, I haven’t been right for the past five years, don’t start taking my word for it now. NP: But crucially, not many drivers over the 60 years of Formula One have done back to back championships. DC: It’s very difficult, because the pressure is on you, but if you sit in a cockpit and you know you’ve got the best car, and you know you’ve got the beating of your teammate, and all due respect to Mark Webber, who’s a fine driver, on his day, Sebastian’s got the beating of Mark, then hey. NP: And perhaps, arguably, when Vettel went wrong last year, it was lack of experience rather than lack of raw talent. DC: Yea. It was reliability at the start of the season, and he lost points through no fault of his own. He should have won in Bahrain and came fourth, he should have won in Australia and crashed out. Then he was chasing, and maybe getting a little bit desperate at times. He’s had a year now, hasn’t he, in that cockpit. He is the youngest world champion, we shouldn’t forget how young Sebastian Vettel is, but he’s a sensational driver. NP: Thank you very much, David Croft. DC: It’s been a pleasure. I’m looking forward to, are you looking forward to it? NP: Me too, can’t wait.